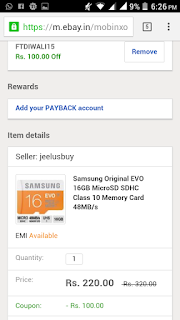 Looking for 16 GB memory card at cheap Price? Then we have got solution! 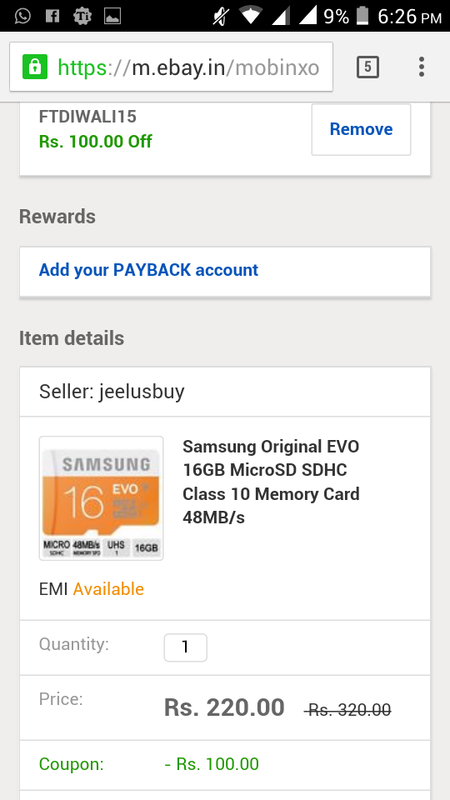 Buy Samsung EVO 16GB Class 10 Memory Card At Just Rs 220. The market value of this product is approx Rs 799 but get this product at just Rs 220 from Ebay . Grab this supersaver deal before it expires. You not get this product at a such price. Coming to Memory Card, It is of Type Class 10. Class 10 SD Cards offers great reading and writing speed Over Class 6/4 Sd Cards. 2. Click on Buy now Button. 3. You will see the price of the product as Rs 320. But don't worry it will come down to Rs 220 as soon as your apply Coupon/Promo Code. 4. After clicking on buy now button, You will be promoted to either Login With your Existing Ebay Account or Just go ahed with Guest Account. 5. Enter your Name, Mobile Number, Email Address, Shipping Address. 6. Now scroll down below you will see a option to apply Coupon Code like "Have A Coupon? Apply here". 5. Click on Confirm Order Button & Pay via Cash on Delivery. Note : Shipping is free. Share this awesome deal with your friends.